I don't know how to begin, but I can tell you how it ended -- with me, my head buried in my hands after I watched the puck trickle past the goal line in Toronto's 3-2 overtime period in front of me. And there I sat as the players left the ice, and there I sat as the fans started leaving and I think the 3 stars were announced. My remaining friend tapped me on the shoulder to leave. I felt lost. It was a totally embarrassing evening by everyone involved with the Rangers. Let's start with management -- I'd like to understand the scheduling of a retirement ceremony (long overdue) for 2 historical players on a Sunday evening up against the Oscars. At 6:35 pm, I was personally embarrassed for the honorees, Harry Howell and Andy Bathgate, as the arena was perhaps 1/3 full when Sam Rosen started the ceremonies. It reminded me of attending a funeral for a WWII veteran as the class of survivors dwindles to fewer and fewer. The Rangers let Bathgate and Howell down by scheduling it at such a dead time. The fans let the organization down by not showing. On the street, scalpers were not buying tickets that were available, the discounted price to attend the game was falling like the housing market. By 7 pm, the arena did starting filling up and was reasonably filled when the game started at the unmerciful time of 8:15. The ceremony was entertaining -- seeing all the retired Rangers, seeing some of the stalwarts of the 1950/1960 era. Eddie Shack came out on the red carpet jitterbugging all the way around. Wade Redden should have been taking notes. The embarrassing part was when poor Michal Roszival was roundly booed as he gave up his #3 jersey and donned a #33 -- at least the jersey made him look bigger. As for the game, Vesa Toskala with a GAA nearly one goal higher than Henrik's defended for Toronto. 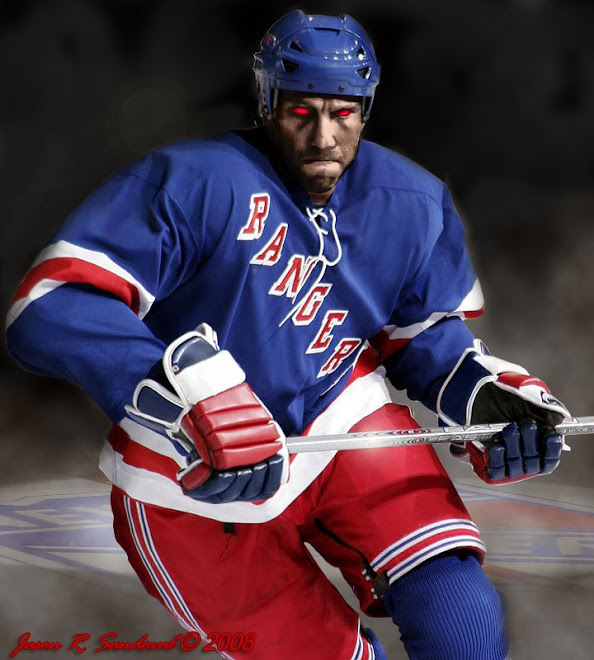 The Rangers, to their credit, did not suffer a letdown from playing the night before as they came out skating hard. The game was even for a while but the Rangers' pop-gun attack had no finishers, as usual. Toronto had numerous chances against Henrik as they sneaked in behind defensemen and had several opportunities with 2 Leafs sitting on the doorstep. During one sequence in the 2nd period, the Leafs had 4 unimpeded swipes/shots literally at the goal mouth with no Rangers there to clear them out before Henrik finally grabbed the puck. At that point, the Leafs were outshooting the Rangers by a margin of 19-12. Although the game was scoreless after 2 periods, the play had started to turn in favor of the Rangers. Over the rest of the game including overtime, the Blueshirts held the puck, passed and shot. During the last 30 minutes of the game, they outshot the Leafs by a margin of 29-7. Yet, only 2 lit the lamp, with the final one by Roszival coming with 39 seconds left to tie the score at 2. The Leafs had 7 shots and 3 went in. The Leafs had perhaps 3 sustained rushes into the Rangers defensive zone in the 3rd period as they were showing the effects of playing the night before. Unfortunately, 2 times they scored. Both scores came on abysmal defensive play. After Toronto's John Mitchell scored with 16 minutes left, 2 minutes later Gomez broke up ice on one of his patented charges to the blue line. For once, he did not have 5 men to play through as he split 2 defenders moved to his right and slid the puck past Toskala's right to tie the score at 1. That was a Jagresque move. Joy in the stands lasted for 25 seconds as Ian White walked in on Henrik's right from the circle and shot a wrister past Lundqvist. His was unimpeded as he approached Lundqvist almost in slow motion like a scene from a sports movie. No one closed in on him and then Bam! it was 2-1 and the energy was drained from the Garden with 13 minutes left. The time went down and after the Rangers were nailed for another too many men on the ice penalty (presumably a direct result from constant in-game line changes) with 4 minutes left, it looked like the Rangers were dead. But Dominic Moore foolishly negated that advantage by holding a Rangers' stick. And for the 3rd time this season at home, the Rangers tied the game with less than a minute to go, just like Graves' night against Atlanta earlier this month, as they took advantage of a 6 on 4 advantage during the final minute when Roszy jumped on a loose puck between the circles and wristed it into the net. In the OT, the Niklas Hagman tip-in looked stoppable by Henrik, it was reminiscent of goals he lets in during shootouts as it trickled slowly over the goal line. However, a 4 on 3 advantage in overtime is a decided advantage because the ice is empty and it's much harder to get the puck and a change. It seemed to be only a matter of time as the Leafs had the puck in the zone for nearly a minute before scoring. The defense was horrible all night long in the defensive zone. It is becoming obvious that their game has regressed. No doubt they feel the pressure not to make any mistakes because they know they do not have a high-scoring offense. No doubt they miss Mara's presence. No doubt there is no one in Hartford to step in to lend assistance. Staal particularly has been playing badly. He has been skating as if the puck has leprosy. On the offensive front, there has been progress. Notably, in recent games, the Rangers have started shooting more from the points. Girardi and Redden have been driving to the net and even leading surges into the offensive zone. Such aggressiveness can come with a price as Redden's poor play on Buffalo's final goal on Saturday night proved but at this point, they need to gamble a bit more to try to get some scores. The fans focused their wrath on 2 individuals tonight -- (1) Redden with his #6 reminding us of his 6 year/$6 million contract. Harry Howell must be cringing watching him play out there. (2) Sather, who was the subject of some growing Fire Sather chants (Hire Avery a distant second). There may have been a smattering of Fire Renney chants, and Roszival got his fair share of boos but he persisted until he score the tieing goal. It's been apparent for some time that jettisoning all the clutch scorers off the team (Jagr, Straka, Shanahan, even Avery) was wrong. Fans who hated those players last season are suddenly nostalgic when their team is not a threat to score 200 goals for the season -- 149 with 22 to go - and no one has scored 20 goals. Meanwhile, Dan Fritsche scored 2 goals last week including a SHG for the Blue Jackets (who are in the playoff hunt) and Matt Cullen scored a hat trick for the surging Hurricanes. Aaron Voros -- numerous lost fights and no goals since before the autumn holidays. The metaphor of the team's futility is best captured by the sight of a woman wandering in front of my section between Gates 79 and 75 as she spent a substantial part of the period looking for her seat. Forlornly, she wandered back and forth, carrying her beer, sometimes assisted by one guard and then by another, scanning the upper rows of the sections. Back and forth she went. A group of 12 guys up in the high rows of section 341 invited her to join them. Back and forth she went. She was lost. Finally, on a pass in front of us, she had a ticket stub and then she had a cell phone in her hand (after like the 8th or 9th trip in front of my section). Did she finally remember that she had them? And then she was gone. The Rangers are lost. Unfortunately, they may not be able to pull out a magic ticket stub or phone to get them to home.